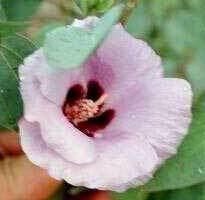 Australian representatives of the hibiscus family are found in all mainland states. Some of these are shown here and some are described under SPECIES. Additional varieties are discussed under ARTICLES. 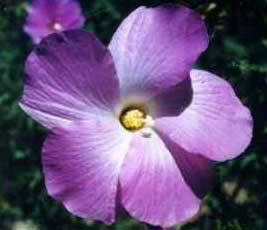 Gossypium sturtianum (right) is the floral emblem of the Northern Territory. It is found in all other mainland states also. Alyogyne huegelii (left) and Alyogyne hakeifolia (below) are members of the hibiscus family found in Western Australia and South Australia. These are now cultivated in other countries. New South Wales and Queensland have Hibiscus heterophyllus and Hibiscus splendens. 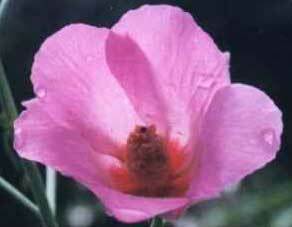 Queensland also has Hibiscus divaricatus as does Northern Territory and Western Australia. This site is primarily about hibiscus and hibiscus like plants that occur in Australia, although some species may also occur elsewhere. There is however information on other hibiscus, such as the tropical hibiscus, Hibiscus rosa-sinensis in the FAQ section. The FAQ section also includes information on cultivation, propagation and availablility of seed online. In addition to more traditional uses, a variety of different hibiscus species are edible and can be used in cooking. Details and some culinary uses can be found under Culinary Uses. Copyright © 2000-2011 hibiscus.org All rights reserved.